As many have already heard, the Adaptive Cycling Center is open again for the season! Come down to the Cycling Center (80 West Bolivar Drive in Berkeley) on Tuesdays, Thursdays and Saturdays (weather permitting) to ride! BORP staff and volunteers will be available to help you find one of our over 80 cycles that will work for you. We offer orientation and training to new riders, independent use of our cycles, and group rides. Click here to learn more. Remember: It’s never to soon to start training for The Revolution! The 15th Annual Revolution Ride and Festival is scheduled for Saturday, September 23, 2017. Click here for more info. 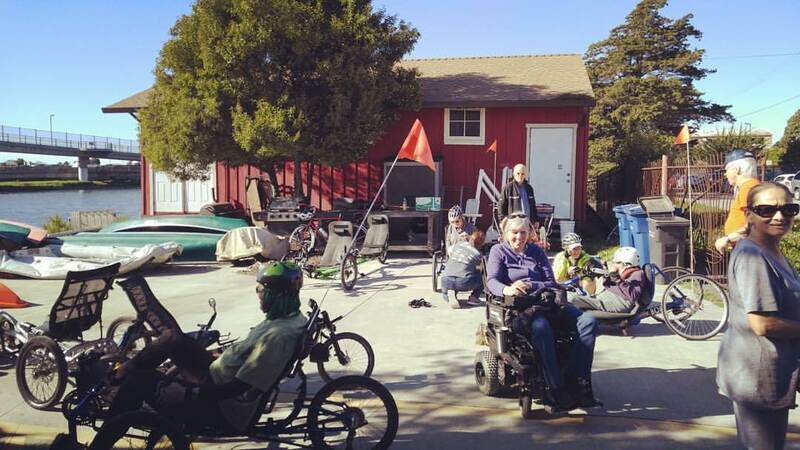 Candid picture of cyclists getting ready to ride at the Adaptive Cycling Center.